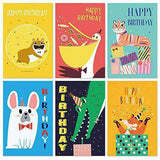 EXPRESS YOUR WISH: Express your blessing in a smart, classy and simple way with these cute and colorful designs. 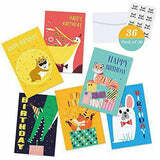 36 PACK OF 6 DIFFERENT DESIGNS + 36 ENVELOPES + 36 PCS STICKERS: With 6 assorted designs (6 of each). 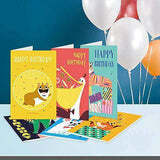 Each birthday card includes a coordinating envelope and sticker to seal it. Be sure to always have a cute card on hand anytime you need to send a thank you or a special note. 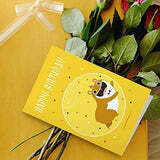 BLANK ON THE INSIDE: Foldable design open style,each card's 4 X 6 measurement leaves plenty of space for showing your sincere appreciation to those special people in your life. 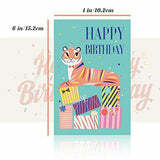 All cards are blank on the inside for customer write what you want to wish. 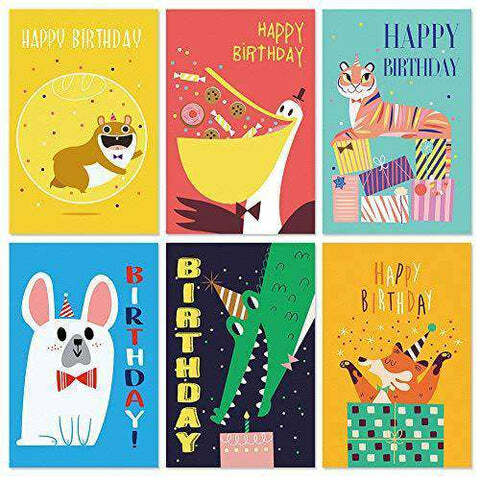 PERFECT FOR ANY AGE BIRTHDAY: Six different designs, you can choose one of style birthday cards for your mom, your coworker, or little ones in your life. Really perfect for your friends, family. 30 DAY MONEY BACK GUARANTEE: If for any reason our product doesn't meet your satisfaction we are happy to give you your money back no questions asked.You satisfaction is our topmost priority.